The old saying goes in this business that it’s tougher to get a good literary agent than to make a sale to a publisher. And in reality, that’s pretty much the case. But it makes sense, doesn’t it? These folks aren’t in the business for grins. 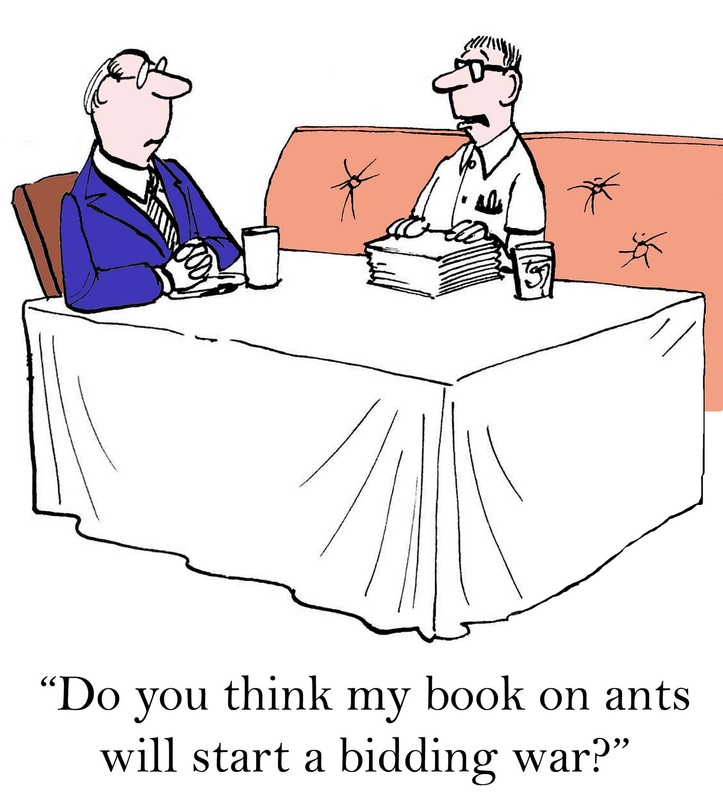 Agents are the front line in vetting a manuscript. They wade through piles and piles of often terrible stuff (how many writers think their manuscripts are perfect and need no editing/critique? Especially in this day of self-publishing) to find a gem or two buried in the muck. And even then, that gem almost always needs work. The manuscript that is completely ready to go is that proverbial one in a million. But when a reputable agent takes on a manuscript (or, as many do, a writer and all of her works), he has a good idea of where to submit it—to which house, which imprint, which editor. And in the back of his mind, he believes he can sell it. Remember, real agents don’t make a dime until they actually do sell your work. So, think of all the time and effort that goes in before making the publishing deal. Boggles the mind, actually. Do they know what’s going to sell for absolute certain? Of course not. Many of the agents I work with are alternately surprised when something sells better than they thought, or chagrined that a work they believe in whole-heartedly hasn’t sold. For the record, the editors at big houses I know go through the same thing So much of this business is truly subjective, from the first portal to the final destination—readers. But pretty much, they know. Agents have their own niches, and though they sometimes go outside of those niches, that’s fairly rare. So, how can you find a good agent? 1). Make sure your manuscript is truly the best it can be. And that doesn’t mean that Aunt Martha, who used to teach English, has a clue to that answer. She doesn’t. You have to work with someone inside the industry, who knows the business, to bring your writing and your book up to publishing standards. There are many ways to do this (another topic entirely! ), but just be certain that yours is as nearly perfect as it can be. 2). Know the market. That’s the agent’s job, right? Nope, it’s yours. It’s your responsibility to find the right agent for your genre; one who specializes in what you’re writing; one who has sold your kind of book. And be able to tell him exactly that in the opening line of your query letter. 3). Settle in for the long haul. Because this takes a lot of time. Especially in today’s tough market, most of the agents I know aren’t even taking unsolicited manuscripts. A book has to be referred. Or, they have to meet you at a conference and be intrigued by your pitch. 5). Get referred. Most of the agents I know are taking referral-only for new writers. Tricky, no? Number 4 above is helpful, but if you can’t go to a lot of conferences, other paths exist. 6). Finally, be respectful but not awed. Literary agents really are just folks, who deal with the written word and sales. I know a lot of them, and they’re just trying to make a living, as is everyone else, and happen to do it via the love of good books. On the other hand, I know how frustrating it can be to get those rejections, but don’t attack the messenger. If an agent doesn’t take you on, do not write back what a lousy sob he is (you would be amazed at how often this happens). Because if so, you’ve just burned a bridge that five years from now may have taken you to that pot of gold. Elusive beasts, these Literary Agents. But if you perfect your craft, have the right book at the right time, do your homework, approach them in a business-like fashion, and keep at it, one just might be yours! Another thing to consider when looking for an agent is that most agencies can’t sustain on their own unless they have one or two bestsellers under their belts. Remember, most literary agents only get 15% on the dollar. That’s a mere pittance when considering how hard it is to sell a book. Therefore, a lot of agents work part-time, unless they work for a big agency that does a lot of volume. My agent is a bestselling romance novelist who works her agency fulltime. She researches her markets endlessly, and is always making new contacts. It took her four years to place my debut novel Swiss Chocolate, and believe me, the process was gruelling. She spent a fortune of her own money on postage and copies. I now work with her, and have helped four new writers get published. Mostly I read manuscripts and make recommendations. What urks me more than anything in the world is when a writer does not follow our guidelines, or addresses me a as Dear Agent. I also scrap any query letter that has a single grammatical error. The art of writing query letters is a whole other topic, but I do read hundreds per week and request the first three chapters if the pitch is compelling enough. The query letter and your synopsis are the most powerful tools to get get you in the door, but I can’t tell you how many times I have read a great query letter, only to be disappointed by a poorly executed manuscript. So, when it comes down to it, the manuscript is what will get you represented. Great insights, James! Thank you. And yes, the art of the query is something we have to work on a lot. I have a process for taking my writers through that. The point is to express to an agent what the book’s about, in a compelling way. And then to have a manuscript that fulfills the promise! Thank you so much for the agent’s view! Thanks for writing this. I am looking for an agent but am working on a few things first.for example, I’ve been going to writer’s conferences. How important do you think platform and branding are for acquisition of an agent? That somewhat depends upon whether you’re writing fiction or nonfiction. In nonfiction, a platform is imperative. Fiction is a bit different, although of course we’re seeing all the “novels” these days “written” by celebrities. So, being already famous always helps in publishing. But so far, having a platform is only a must with nonfiction. Most of the agents I know want nonfiction writers with an established venue for selling lots of books! Hmmmm…it’s hard to stay on that pedestal, isn’t it? Excellent article! Your advice and suggestions in this and other articles I’ve read of yours is right on target. Keep up the good work! And thanks! Just curious, since I don’t know much about agents, having never bothered to send any query letters (I was too busy writing and publishing my book): Are agents willing to represent authors for film, TV and foreign rights only? I have no interest in submitting my books to the Big Six or any traditional publishers, but I AM interested in having someone with knowledge of the industry assist in film/TV rights in the US, and foreign rights in general. Actually, yes–some agents do represent just foreign rights. Some will represent just film/TV rights. Check out Jeff Hermann’s Guide to Publishers, Editors, and Literary Agents–he compiles the most comprehensive list I know. Thanks so much for the great article. You put a lot in a very comfortable nutshell. I’ve been both writing and learning the publishing industry for a good 10-12 years now, as well as watching shifts and changes along the way. From an agent’s point of view as far as my background and credentials in my field, just how much does it matter that I’ve been published 75 times in industry magazines? Does it help at all in increasing the chances of a book deal? I sometimes wonder . . . The books I’ve produced so far seem to fit more of a small niche market as far as sales are concerned (which is very important to success), though the industry I work in (Food and Beverage) is huge! My upcoming book in early 2012 is a collection of short stories and encounters based on my many experiences here in Los Angeles, currently located on my Blog. I’m thinking this content will fit a wider range of mainstream interests than my previous. With this one, I do plan on seeking literary representation. Since they’re non-fiction, what category/genre would they fit in more – short stories, memoirs, essays ? You know, it does help that you’ve been published so much in industry magazines. It shows you are a professional, and your work has been vetted by industry professionals. It will help the chances of a book deal IF you’re targeting the same audience. That’s publishing in a nutshell–they want to know you have and are building an audience. As per the collection, if they are short stories, then the genre is short stories as well. Do know that most agents don’t handle those, unless most of the stories have been published in magazines, quarterlies, etc. You are building an impressive resume! Keep up the good work! Thanks so much for your response. Your expertise means a great deal, and I hope to employ your services one day soon. My published magazine articles and feature covers from 2002-2009 are not my short stories, so it looks like I’m SOL with an agent on that, even though I’ve been building an audience with the stories on my Blog for about 18 months now and continuing. I can and have targeted the same audience, but it’s a bit preaching to the industry choir, I would prefer building a wider mainstream audience, as I plan on a Book 2 and 3 in a series of stories spanning 30 years of work on stage, titled “Life Behind Bars”. I will keep up the good work ! You’re doing all the good, Kyle. Keep building that audience, and widening it as you go. That’s one big key to publishing these days. Also, start submitting your short stories to magazines and quarterlies. The more that get published, the better your chances at selling the collection. Publishing really is a numbers’ game!